Vendor price includes one (1) covered table and one (1) meal for a representative of the company; each additional meal cost $25; must contribute a raffle prize that will be given to guests at the lunch (east guest will get a raffle ticket); in addition to raffle prize, each vendor can set up their own basket for members to put business cards in to give away a smaller prize such as swag, etc. ; vendor will speak briefly (1-2 mins) about their business. -Rigatoni Pasta (with Crushed Tomato Sauce, Italian Sausage, Rapini, et al. Be sure to bring a teddy bear for the Bears on Patrol program. 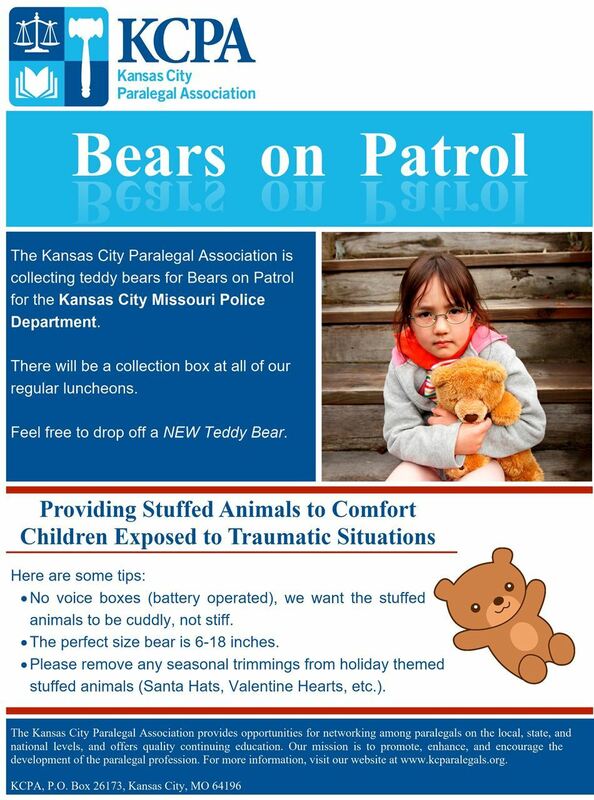 During the meeting we will hear from an officer of the KCMO Police Department on how collecting and donating teddy bears impacts and comforts children in domestic disputes, motor vehicle collisions and other devastating situations. Let's surprise him with a HUGE amount of teddy bears. Click here for more information. We will have our vendor showcase with some amazing raffle prices. We will also be introducing new and returning officers to the Board of Directors.